Being a waiter or waitress is not an easy job. The work is physically demanding. You’re likely to spend a whole shift on your feet, rushing about. It can be financially rewarding, and big tips can be worth it, but the work is not for everyone. Being a waiter requires a very specific personality and skill set to succeed. Waiters and waitresses are responsible for greeting patrons, seeing to their needs, and delivering accurate and prompt service. They're required to take orders, to stay attuned to the needs of the customer, and to be effective communicators. Some physical skills are required of waiters and waitresses, like lifting heavy trays and moving quickly between the kitchen and dining room. Below is a list of the top five most important skills for a waiter or waitress, as well as attached supplemental lists of related skills employers seek in candidates for table-waiting jobs. These skills lists can be used throughout your job search process. You can use these skill words in your resume, both in the initial summary of qualifications and in your descriptions of your work history. You should also try to incorporate many of these “keywords” in your cover letter. Mention at least two or three of these skills in the body of your letter, providing specific examples of times when you demonstrated them at work. Finally, you can use these skill words in your interview. Make sure, before you go into your interview, that you have at least one example of when you demonstrated each of the top five skills listed here. Of course, each job will require different skills and experiences, so make sure you read the job description carefully, and focus on the skills listed by the employer. Also review our lists of skills listed by job and type of skill. Waiters and waitresses must be attentive listeners. They should listen carefully when taking orders, as sometimes people’s needs are complicated. A good waiter or waitress should be able to remember the needs of their customers in order to communicate these desires clearly to the cooking staff. They should also be able to remember and convey any messages, should the kitchen wish to communicate anything to the customer. Customers may ask questions about menu items or other details, and a good waiter or waitress should be able to converse with the customer in such a way as to answer questions and to meet their needs simply and thoroughly, with little complication. Part of good customer service is maintaining a high attention to detail. Restaurant patrons can, at times, be demanding and even rude. A good waiter should be able to meet the needs of the customer, even when they’re not being entirely reasonable. A high energy and diplomatic comportment, even in the face of interpersonal conflict, could affect your tip-dependent income. Being a waiter or waitress will often mean you need to have good hustle. Working at a fast pace is critical, but so is maintaining an appearance of assuredness and calm. A good waiter or waitress will move swiftly without appearing to run or rush. A high level of focus and attention makes working quickly easier, because when you’re honed in on the details of your respective patrons and tables, you’ll be meeting their needs in rapid fire in order to close one check and get new folks into those empty seats. Waiters are always managing several things at once. Sometimes one table will be ordering cocktails at the start of their meal while another meal has moved onto dessert while still another is ready to be cleared and turned. 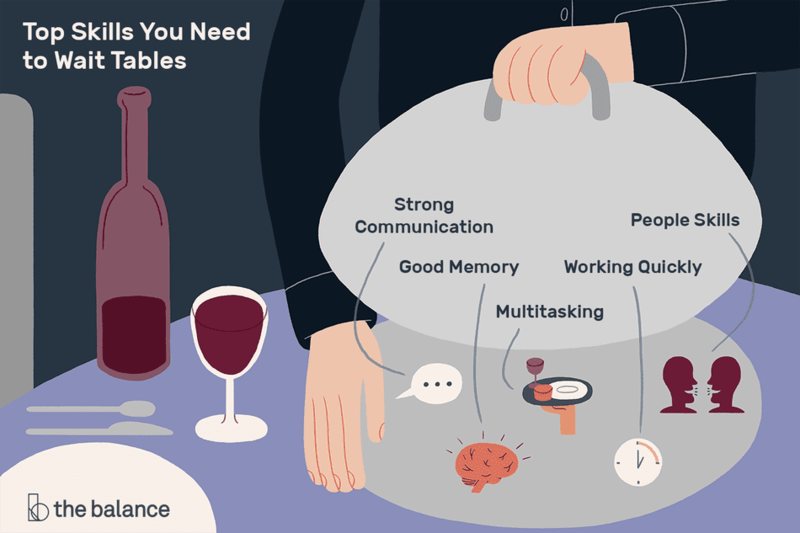 Each table moves through its own little life cycle, and it’s critical that waiters and waitresses remain attuned to the various levels of need each table or customer may have in a given moment. Each customer orders their meal differently. Some may insist on a certain meal without a certain ingredient. Some want lemon in their diet soda, while others want no fruit in their regular soda. A pad and pen will come in handy, but nevertheless, a waiter or waitress must possess an innate ability to recollect all sorts of mundane details, again and again, over the course of a shift. A waiter will also be required to remember all sorts of details about the food and beverage lists. Food service can be tough on your body, but ultimately very lucrative. It’s not for everyone, but if you possess the top five skills we’ve just discussed, it could be the perfect fit for you.